Solutions Recovery Club located in Oshkosh is one of the resources local residents use to fight their addictions. For Olivia Werner it was the circumstances surrounding a friend’s suicide just a few months before high school graduation that triggered a rapid descent into alcoholism. Her once- or twice-a-week habit of drinking turned into a daily routine as she reacted to the trauma of her friend’s death and her own foolish decision to “celebrate” her friend’s memory by getting drunk. John McHugh began using heroin at the age of 13. For 18 years he battled with himself to turn his life around after being disowned by his family, dropping out of college as a freshman and living couch to couch. His lowest point came after he introduced his girlfriend to heroin and she ended up dying from an overdose. Both of these individuals saw the worst in life. They faced heartbreak, isolation and struggle after struggle, yet they managed to pull through to turn their life around. Werner and McHugh, both Oshkosh residents, represent a side of the nation’s addiction crisis that seldom gets attention--addicts who are now engaged in the long process of recovery. Although such individuals seldom make the headlines, their numbers may be surprisingly high. A national survey released in 2012 by the Partnership for Drug-Free Kids and the New York State Office of Alcoholism and Substance Abuse Services found that 10 percent of adults across the country reported being in recovery from substance abuse or addiction. If those statistics hold in a community like Oshkosh, that would mean that the local recovery population numbers 5,000. 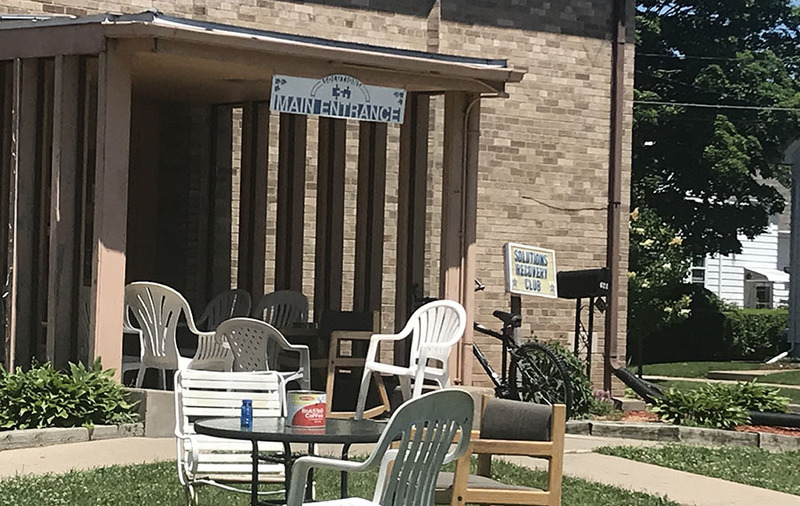 Carol Morack, the Safe Streets Drug Court coordinator for Winnebago County, was unable to provide an estimate of how many individuals in Oshkosh are in recovery since such programs are based on anonymity. Even if the 5,000 figure is high, there is little question that Oshkosh has a significant number of residents working through recovery. While recovery is an individual process and is often kept private, many addicts, including Werner and McHugh, want people on the outside looking in to understand the work that goes into getting sober. They view their addiction as a disease, just like cancer or diabetes, and they agreed to tell their stories, under their real names, to create greater public awareness of the situation they share with so many others. It’s well-known that Wisconsin has a strong culture for drinking, Oshkosh plays well into that environment with a variety of different celebrations such as beer gardens and Pub Crawl. For Werner, the consumption of alcohol went further than just the average leisurely enjoyment, leading her to explore other drugs and begin a dependence on alcohol. Werner said the drugs weren’t a constant thing during her addiction, but the drinking was the one consistent behavior she kept up. Werner said the beginning of her addiction stemmed from hanging out with her brother, but she found her own pathway to continuing when she broke off to join new friends in the party scene. Werner said being in recovery helped her realized that her addiction stemmed from issues of abandonment she felt when she was younger. Werner often felt she was alone, which helped her turned to drinking to subdue the feeling. Werner said the drinking helped ward off the loneliness she was experiencing and gave her a sense of belonging. In addition to the family issues, another reason for her turning to alcohol came from the trauma from two past incidents of sexual assault. Werner said her addiction not only took a toll on her, but also her relationship with her brother. She said they had always had a good relationship until he tried stepping in to break her addiction cycle. Werner said getting sober was so hard because she didn’t see her addiction as a super-serious problem. Werner said addicts don’t really worry too much about what kind of consequences their addictions can bring on, which is what makes having an addiction that much more dangerous. Werner said even being in recovery she still faces this internal battle of keeping the urge to start drinking again at bay. After losing her friend right before their high school graduation, Werner said the drinking problem became more frequent due to the regret she felt from not properly sending her best friend off. What began as a weekend treat became an everyday numbing agent to deal with the loss. Werner said one of the turning points toward her becoming sober was a health scare she experienced in which she was diagnosed with gastritis. “With my physical health, right around the time of my sober date, I had drank a whole bunch of vodka, and I was throwing up blood,” Werner said. Werner said that still wasn’t enough to stop herself from completely giving up her drinking habit, and she still headed to a party where she ended up drinking through the pain. Once Werner went to the hospital, she finally realized it was time to get some help. Werner said she began her recovery program here in Oshkosh before heading up to Appleton for the next phase of it. Werner said she then turned to a 12-step program to help get on the right path of becoming sober, which included getting her own sponsor to see her through the process. “Keeping me sober today I would say is definitely going to meetings. I usually hit up about three a week depending on my work schedule,” Werner said. Werner explained how the 12-step process works for addicts, beginning with owning the problem and coming to terms with who brought them to their addiction in the first place. She said Steps One through Three are all about surrendering to a higher power and coming to terms with who has wronged them in the past. Werner said the next steps help addicts open up about their past choices and what they need to change while learning to give all of those to their higher power. Werner said the last of the 12-step process includes making amends to those they have hurt as well as helping others work through the steps with the knowledge and experience they’ve gathered through their journeys. Werner who is now 19 years old, currently works at Applebee’s in Oshkosh in addition to managing the sober living house she stays at. She is looking to helping out her recovery community more, especially those who have dealt with sexual assault. Werner said her goal is to create a safe space for women who have been in similar situations during their addiction journeys. Werner said she wants the community looking at recovery from the outside could be more understanding of what kind of steps go into it. According to the Winnebago County coroner’s office, in 2017 there were 26 total overdose deaths for the year, 19 of which were from opiates such as heroin and fentanyl. John began using one of the better-known opiates, heroin, when he was just a young boy. Growing up in Bakersfield, California, he struggled with own addiction journey that eventually brought him to Oshkosh for recovery. McHugh said he began his drug use by experimenting with several different drugs until he became focused on heroin. “I guess I first started using any drug around 13, started drinking and smoking weed. Then I got into meth for a little while, for a year or so along with some other stuff. I found heroin at about 14 years old going into 15. McHugh said his addiction stemmed partially from the environment he was growing up in. McHugh said his father had high expectations and would forcefully express his disappointment. McHugh said another reason he got into drugs was from feeling isolated from the rest of his peers while he was in school. McHugh said although addiction comes from a place of feeling alone, it somehow never seems to miss the people who seem like they have it all as well. McHugh said he started to become more violent the longer his drug use continued, eventually putting his family at risk. McHugh said the behavior toward his family caused them to basically disown him and leave him living out most of his adolescent years in the juvenile detention system. McHugh said the people he met when he left his parents’ home were who helped keep his addiction fed. McHugh said it was easy to stay in that lifestyle because there was not much else outside of that for him to work toward such as a job or school since he dropped out of high school as a freshman. McHugh said having his family turn their backs on him hurt at the time, but now he understands why they had to do it. McHugh said with having a drug addiction, there are a lot of moments where you feel you’re the only one on your team rooting for you. McHugh said a reason many addicts find it hard to break out of the cycle is that they have family who mimic the same behaviors and feed into those negative choices. McHugh said he had the support of his father to help get him out of the environment that was keeping his addiction alive in California. McHugh said although there were resources in places, there needed to be more set in place for him to get into recovery. McHugh, now 34 years old, said joining a 12-step program helped him get the help he truly needed after his 18 year addiction. McHugh doesn’t take his recovery lightly, knowing that many addicts can’t break free from the cycle. Right now McHugh works as a DJ in the area as well as managing the sober living house that he stays in. He doesn’t have any immediate future plans, but rather just looks to take things on day by day. McHugh said the view of addiction has changed from what is was when he first began using, but he also believes that there is still more room for improvement. McHugh said people who haven’t been addicted to a substance should understand that the people who are struggling with it don’t want to be the way they are or just decide to get wrapped up with it.